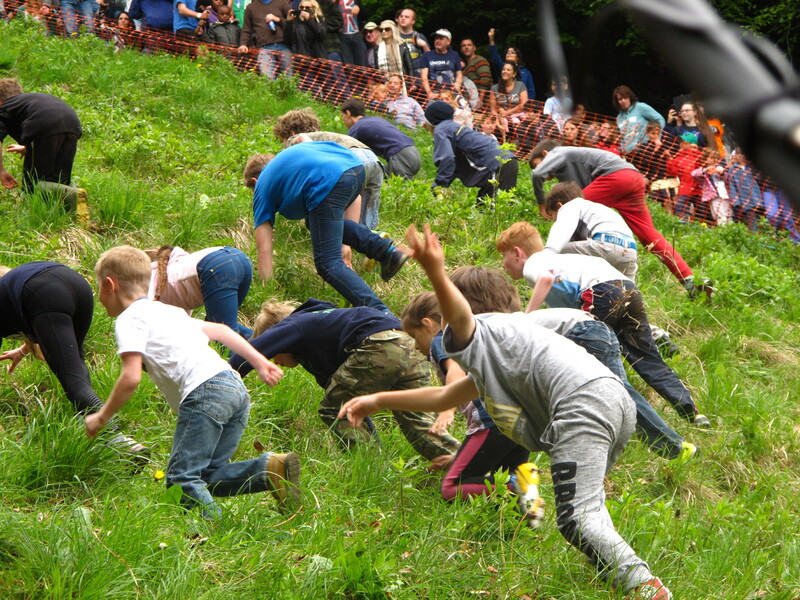 Bizarre British festivals: Gloucester cheese rolling | Notes from the U.K. 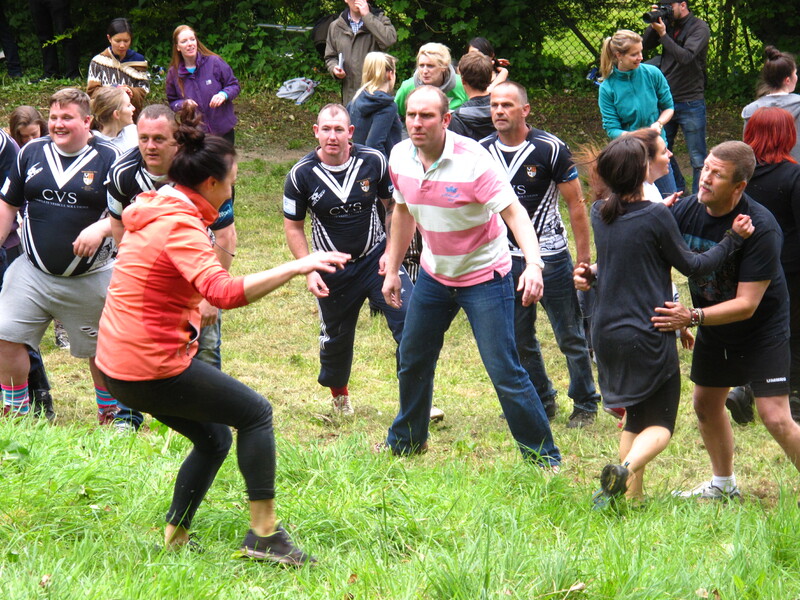 This entry was posted in Traditions and tagged Americans in Britain, Americans in England, anglophile, Britain, England, English traditions, Gloucester cheese rolling, humor by Ellen Hawley. Bookmark the permalink. This is one of my favourite traditions and is bizarre even by British standards. I don’t think I would mind being caught by the rugby team at the end, though. Getting caught by the rugby team is, I’m guessing, very much a matter of personal taste. I could see how it might weigh heavily in favor of entering. Later in the year, Wild Thing and I hope to go watch the flaming tar barrel race. Now that’s got to top anything for outright craziness. That is even crazier than the cheese, with an added element of peril! Yes. And in a country that takes health and safety seriously. This is nuts! I can see the appeal in watching it but doing it? I don’t think so. Crazy how these events are created, take off and last over the years… Glad you blogged about it. If ever in the area, I would watch it. Completely nuts, and well worth seeing. The funny thing is, when you’re watching it with a few thousand of your closest friends, it begins to make sense. I found myself thinking I could do it. And knowing that no, I couldn’t. Yah, you get caught up in it and it seems doable…. only to find out, not! It definitely ranks as one of the strangest cheese events I have ever heard of. I loved being a spectator. I draw the line at running, though. I’ve passed the age where I bounce well. It is–wait, I’m searching for the right word–memorable. This one counted as fancy dress. It wasn’t anything he’d be caught wearing north of the border. Good one. I wonder if the police have considered ticketing it for breaking the speed limit. Hilarious and informative. Please check out notesfromtheuk.com. Does anyone EAT the cheese after that? Absolutely. It has a rind on it. Hmmmmmm, even with a rind, it seems strange to me. Strange? Yes. Definitely. But edible. Many thanks. And I thought the chuck-a-welly and axe throwing booths at village fairs were strange. Great link. And in case anyone’s wondering, it’s not spam. It’s about a cabbage-throwing event. Do check it out. I’ve actually always wanted to see this for myself but never have. Your account is the next best thing. I’m a cheesaholic. I can’t give the stuff up even though I’m seriously lactose intolerant. But even I would not hurtle full tilt down a hill giving chase after a cheese. Insane. I wonder if anyone has considered the possibility that a cheese making guild started the whole thing as a publicity stunt for their produce, turning mouldy milk into the stuff of legend. It’s possible, but whoever started it I’m convinced that a lot of beer was involved. This is completely fabulous. Added to my bucket list! Bizarre definitely seems to be the right word. Even your pix look bizarre! How funny that no insurance will cover this and yet people show up in droves to take part. 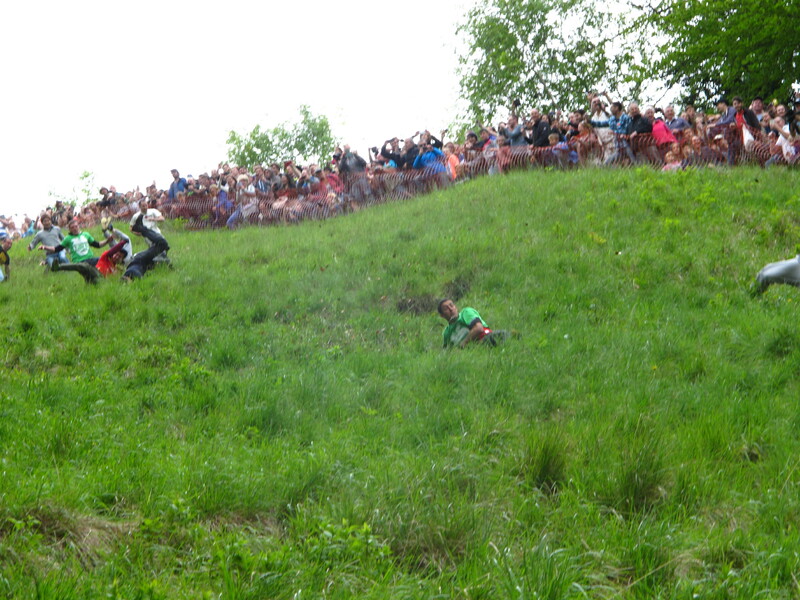 Very much enjoyed your attempt to find the top of the hill, though……had me laughing all the way through this post! Happy to entertain. The pictures don’t even begin to do justice to the hill. Our best local cheese in Leicester is Sparkenhoe Red Leicester. Try this, not the plastic stuff sold in supermarkets. To the north and west of us is Stilton territory. We are much more sensible than Gloucester folk as there is no “stilt” walking race. We do have crazy bottle kicking matches at Hallaton, though. Ohhh, stilton. I don’t eat a lot of cheese (too much lactose tips me over the digestive edge) but every so often something compels me to buy a hunk of stilton and eat it way too quickly. I might consider chasing it down a hill. Double gloucester, though? I’m happier on the sidelines. I never heard of the Hallaton bottle kicking. And I thought axe throwing at the village carnival was strange. Awesome. 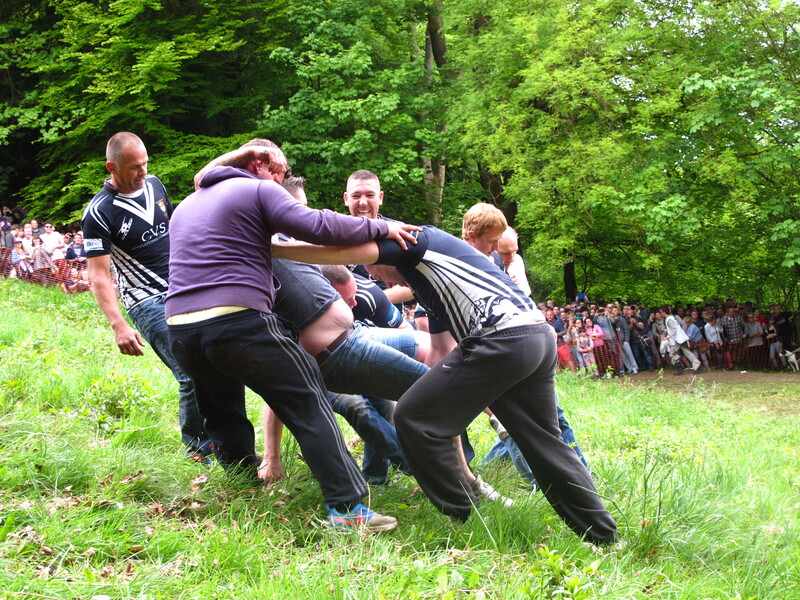 Cheese rolling is now on my list for next year and I had never heard of cabbage hurling but that sounds great too. Can you put a list of all the crazy events you are planning on going to this year as a blog post? So I don’t have to – or is that really lazy of me? It’s really not much of a list. Ottery St. Mary’s, in Devon, has a flaming tar barrel race in the fall, which we hope to get to, although we’re thinking of going to a smaller, closer, less completely insane one instead, in Hatherleigh, also in Devon. Beyond that, we’ll have to see what else we hear of. You might enjoy my post on the Padstow May Day festival. The problem for a visitor is that they’re scattered throughout the year. Thanks. That’s flaming tar barrel racing, cheese rolling and cabbage hurling to do in the next 12 months. I will get to know my own island’s craziness. And ianbcross added the Hallaton bottle kicking contest. This is hilarious! All that fight for a wheel of cheese! …and when there aren’t enough cheeses, they do it for the glory. Wild Thing argues that double gloucester isn’t even a particularly good cheese. I’m now laughing even harder with that comment from Wild Thing! You just have to love this tradition! What about the Dorset knob-throwing which sounds like something you and wild thing should attend and report on. A knob is someone you don’t like, right? I’m not sure I’m strong enough to participate, although I suppose it’ll depend on how big the knob is. Or are we talking about the biscuits? Either way, we’ll have to check this out. I thought you told me a few months ago they don’t use actual cheese anymore? I did, and they didn’t. The webs site talked about a year when they substituted a plastic pseudo-cheese. But it didn’t roll the way a real cheese does, and I guess they went back to the real thing. The disadvantage of the United States being a young country is that, while we do stupid things, we don’t have the tradition of doing them for hundreds of years. All too true. I keep thinking that for the sake of evenhandedness I should make fun of American political traditions as well, but because they’re not wrapped up in such bizarre trappings they’re not as funny–just maddening. It is a challenge, but I am not giving up. I’ve been putting some thought and my history degree to it. Wish me luck. Bloody hell. I wouldn’t like to be a police officer there. They keep themselves half a mile or more away, so they’re not getting any real grief–except from the drivers they turn away from the blocked roads. But they do miss all the fun. Pingback: Bizarre British festivals: the flaming tar barrels | Notes from the U.K.
Pingback: Great British traditions: the boot sale | Notes from the U.K.
Pingback: The Gloucester Cheese Rolling: a handful of links | Notes from the U.K.